This course is 24' long and provides a lot of challenges and fun. Participants can compete against each other or go through the course alone. 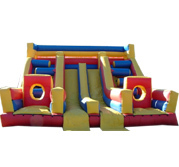 Kids compete by negotiating a 4' climbing wall, then maneuvering around the pop-ups and the squeeze bars, and finally racing through the tunnels. Perfect for kids 3-6. No picture of this BRIGHTLY colored 40 foot long obstacle course that will provide hours of fun and competition. 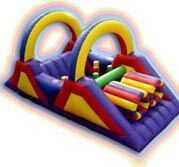 It has a climbing wall, slide, and an obstacle area, this is guaranteed to attract attention at any event. Recently was a favorite at Freedom Fest 2008! Get ready for intense fun as participants race through tunnels, log jams, crawl throughs, up and overs and ladder climbs, and finally whipping down a 16' slide. Perfect for a team building events or just having fun. This is a combo unit we guarantee in stock. If we don't have it for your event, you can have any other combo for half price!! Comes complete with a bounce area, basketball hoop, climbing area to a slide. This 3 in 1 Castle offers a little bit of everything for everyone. 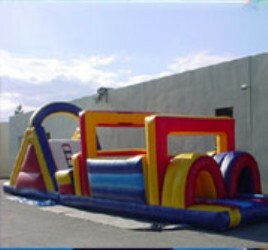 It boasts a 13 foot by 13 foot bounce area, a climbing wall, and a slide. 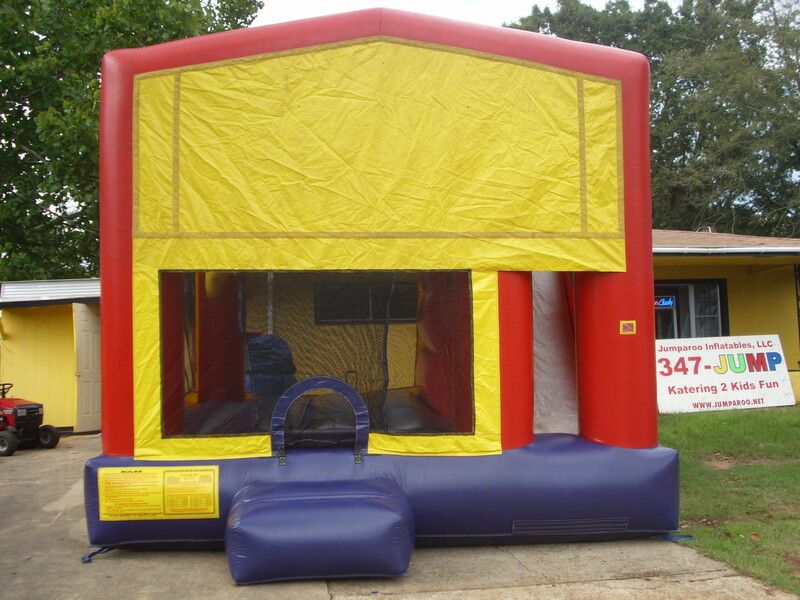 It has an extra large base to keep your kids bouncing for hours. This is the NEWEST addition to Jumparoo. 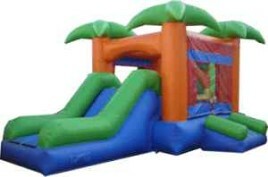 The "Tropical Combo" comes with colorful palm trees and has a large slide outside the bouncing area. This combo is quickly becoming the most requested unit so BOOK EARLY to ensure availability. A true challenge as you attempt to knock your opponent off of his or her stand. Not to worry though since the whole area is an inflatable unit and you can just brush yourself off an go at it again. First one to knock his or her opponent off with the foam-filled joust poles wins! A must have for fund raising events! Strap into this unit and see how far you can place your velcro marker. Have even more fun and laughs by challenging someone to run beside you and attempt to place his/her marker farther than yours. The fun really begins after you place your marker down... you will see what we mean. This is another interactive game that is great for fund raisers or corporate team building events. Their imagination will run wild in this 4 in 1 Wizard Combo. 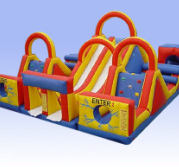 There is a large bouncing area, a mini obstacle course, climbing area, and a slide. 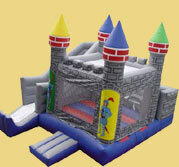 Kids will be running and bouncing through this castle for hours upon end. 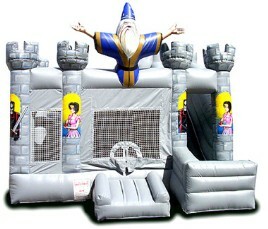 This castle is guarded by a huge Wizard and has princesses and knights on the outside. This huge three unit combo will provide an Extreme Playtime rush for all that enter. The Adrenaline Rush has a total of 80 feet per lane to complete. 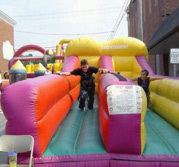 It has eight obstacles where participants jump, climb, crawl, squeeze, and slide their way through this amazing course. The first one out the obstacle is the winner. Great for fund raising because of the quick traffic flow! 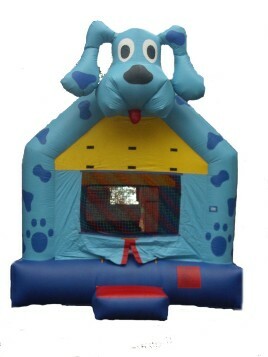 This blue dog bouncer has a striking resemblance to the one on a popular TV show. Great for parties that are "animal themed". Kids will be entertained in this bright blue unit.